WARSAW, Ind. – Western High School has a long history of very good female basketball players. Names like Wendy Aldridge (Indiana Basketball Hall of Fame 2014 Silver Anniversary Team member), Tiffany Reida (1,000 Point Club) and Nicole Rogers (second all-time leading scorer in Howard County history) have brought recognition to the Russiaville school. But none have reached the level of success like this year’s sixth-ranked Lady Panthers. On March 8, Western will play in its first-ever basketball state championship game after they knocked off No. 12 Norwell 41-31 in the IHSAA Warsaw Class 3A North Semi-State last Saturday evening. The Panthers are a senior-laden squad and four of its five starters played in the Final Four as sophomores. For Givens, Carley and Caitlyn O’Neal and Kiersten Durbin, this win has been in the makings for at least six years. The Lady Panthers and Lady Knights are both known as defensive powers, so it should not have been a surprise that the scoreboard showed a low-scoring halftime score: Western led 15-12. Neither team had many open shots – Western shot just 24 percent while Norwell came in at 17 percent at the break. But as Norwell found itself with a four-point lead (19-15) three minutes into the second half, the Lady Panthers ensured that they kept their heads – and hearts – in the game. Just as Norwell looked to take command, Givens hit a 3-pointer that sparked a 19-5 Panthers run that was simply too much for the Lady Knights. Add in that Western dropped in 12 of 15 free throw attempts in the final stanza, and the Panthers are headed to the state championship game. Givens and Carley O’Neal led the Panthers with 10 points, while Durbin sparked the squad with seven of her nine points coming in the first quarter. Caitlyn O’Neal added all eight of her points in the final quarter on 8 of 9 free throw shooting down the stretch. 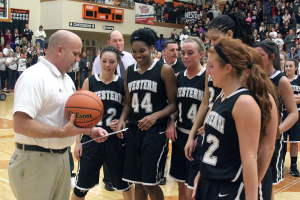 Raven Black added the other four points for Western. Western (22-3) advances to the IHSAA Class 3A girls basketball state championship game at the Hulman Center in Terre Haute on March 8 at 6 p.m. The Panthers will battle No. 2-ranked Evansville Mater Dei (26-1), the same club that defeated Eastern in the Class 2A title game a year ago. Mater Dei, led by Miss Basketball candidate and Indiana recruit Maura Muensterman, is the two-time defending 2A champion but moved up to 3A due to the IHSAA Success Factor. Douglas Hockney and Chris Lowry/WIOU contributed to this story. This entry was posted in Basketball, IHSAA, Western. Bookmark the permalink.